The Sun’s outer corona consists of plasma whose temperature exceeds one million degrees. This extremely hot corona is located only a few hundred kilometres above the solar surface known as the photosphere that maintains its temperature around 6000 degrees. A longstanding problem is the energy source for the corona and a mechanism that deposits this energy and heats the corona to such high temperatures. Despite numerous space and ground-based observations, and extensive theoretical efforts, the problem still remains unsolved. 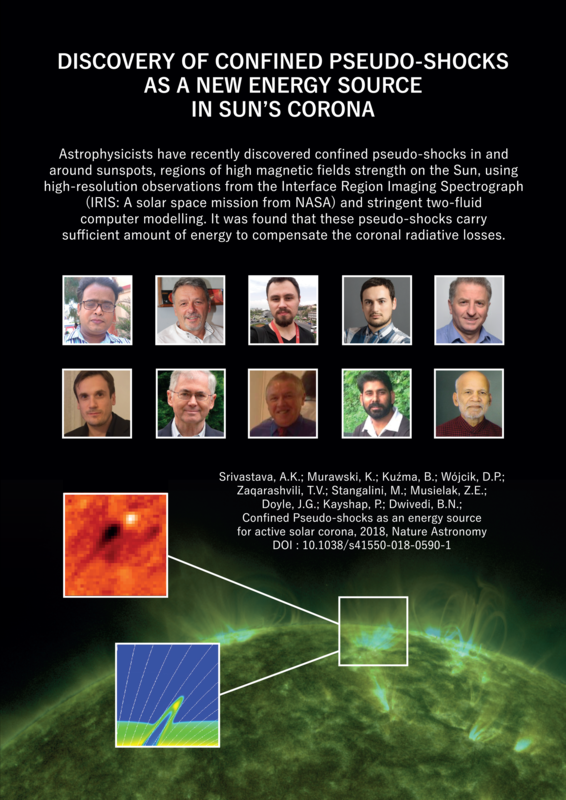 This is not surprising as the problem is very complex and its full solution requires a unique combination of new solar observations and novel theories dealing with the formation of the solar atmosphere and its magnetic fields. Such unique approach undertaken by a group of researches has been completed and the obtained results are briefly described in the following. National Science Center (NCN) granted money for futher development of JOANNA code and research focused on two-fluid model of the solar atmosphere. Description (in Polish) can be found here. The Sun’s outer corona exists with a temperature of a million degrees and is separated from its cool surface (the photosphere), which is 6000 degrees, by only a few hundred kilometers. A major problem in solar physics is explaining how and why the corona is so much hotter than its surface. The answer to this problem lies in the complex magnetic field which tightly woven within the atmosphere of Sun. Over the last few decades, numerous observatories in space and on the ground have provided a range of explanations for the origins of this solar coronal heating. Two competing physical mechanisms are generally accepted to explain the heating process. The first is known as magnetic reconnection, which is an explosive release of the magnetic energy, trapped in magnetic fields in the corona (otherwise known as a solar flare). The second is the energy for heating provided by oscillating magnetic fields in waves (otherwise known as Alfven waves). Detecting these magnetic field oscillations requires advanced numerical simulations combined with the highest resolution images available to solar scientists. Only now has the wave origins behind the heating of the solar corona come into full view. An international team including researches from five countries, and lead by Professor Gerry Doyle from Armagh Observatory and Planetarium reports on a new discovery made using the Swedish Solar Telescope at La Palma, showing first ubiquitous presence of high frequency (~ 47-84 sec) waves at numerous thin magnetic flux tubes in the quiet-Sun magnetic network transferring energy into the overlying corona. They serve as substantial sources of energy flux not only to heat the solar corona but also to originate the supersonic solar wind. The work is published recently in Nature Scientific Reports (Link to artilce) lead by Dr. A.K. Srivastava from Department of Physics, Indian Institute of Technology (BHU), India. Other team members and co-workers are Juie Shetye, a PhD student at Armagh, Dr. Eamon Scullion from Northumbria University, Prof. B.N. Dwivedi from Department of Physics, Indian Institute of Technology, Varanasi, India, Prof. K. Murawski and Dariusz Wojcik from UMCS, Lublin, Poland, Dr Marco Stangalini from INAF, Rome and Professor Tom Ray from the Dublin Institute for Advanced Studies, Ireland. Armagh Observatory and Planetarium is funded by the N. Ireland Department for Communities, while additional funding for this project came from the Leverhulme Trust and the European SolarNet programme.